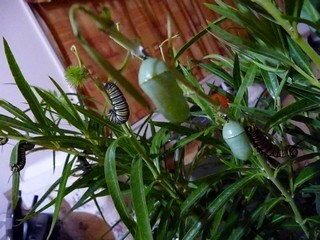 How a caterpillar becomes a chrysalis is fascinating. It hangs for a while as you can see in the first picture, with its head curled up. 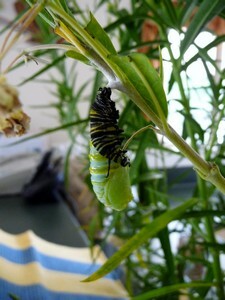 Then it starts wriggling and the skin splits and is pushed up toward the top of the body (pic 2). Then it is almost removed by picture three and is so by #4. It knows the skin is sitting on the top and wriggles until it falls off. 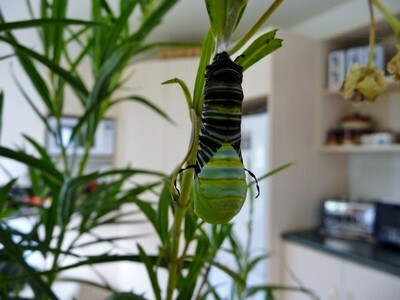 Then the ridged chrysalis smooths out and a black stitching line appears near the top. 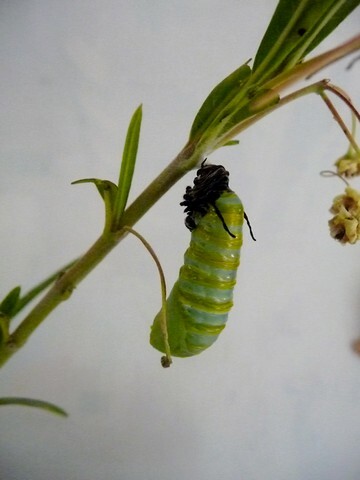 It ends up looking like the chrysalis' you can see back in the top picture. The instinctive design behind this behaviour leaves me convinced that a superb designer has to be responsible.